Bus from Johor Bahru to Jasin is the only available public transportation to travel between the two cities because there is no train and flight service cover between Johor Bahru and Jasin. Many locals, especially working adult and student in Johor Bahru and Singapore with their hometown in Jasin, rely on express bus to travel from Johor Bahru to Jasin during weekend break or off days. Mayang Sari Express is the only bus company serving bus from Johor Bahru to Jasin. Mayang Sari Express is one of the reputable bus company by providing quality bus service in Peninsular Malaysia. Their bus services cover wide range of bus routes. Mayang Sari Express has up to 3 daily trips from Johor Bahru to Jasin operating with VIP coach. The first bus service is starts as early as 9:30am. The following schedules are 2:00pm and 6:00pm. The estimated duration from Johor Bahru to Jasin requires about 3 hours depending on the weather and road traffic condition. VIP coach deployed by Mayang Sari Express offers comfortable 3-hour journeys to passengers. Washroom break will be given upon request from the driver during the journey. The bus fare from Johor Bahru to Jasin is reasonably charges at RM 19.00 for adult and RM 15.00 for child. The pick-up point in Johor Bahru is located at Larkin Bus Terminal. Larkin Bus Terminal is the largest bus terminal in Johor where they are easily accessed via intercity bus and taxi. The drop off point in Jasin is located at Jasin Sentral Bus Terminal. 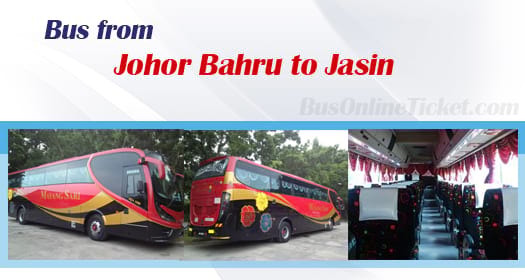 Due to limited seats available from Johor Bahru to Jasin, passengers are strongly encouraged to book their bus ticket online through BusOnlineTicket.com. The booking process in BusOnlineTicket.com is simple and user-friendly. Instant confirmation email will be given upon payment is done.